Food and Land | Sustainable food production for 9 billion people. Sustainable food production for 9 billion people. Halocarbons are industrially produced gases whose main use is as refrigerants in fridges, freezers and in air conditioning systems. The largest source of halocarbon emissions is commercial refrigeration, including food storage . Although refrigerant gases are emitted in relatively small quantities compared to CO2 and methane, due to their chemical structure they have a much higher global warming potential, hence their relatively large contribution to global warming, accounting for 11% of all anthropogenic radiative forcing, according to the latest IPCC data . Currently official national greenhouse gas inventories exclude all CFCs and HCFCs even though they are responsible for approximately 85% of the global warming from halocarbons  . This is because they were assumed to be dealt with by agreements to phase out ozone depleting chemicals. However, this has failed to tackle the problem and overall, they continue to be a menace both to the climate and the ozone layer. CFCs still at high atmospheric levels. Although use of CFCs in fridges has largely stopped because of their destructive impact on the Ozone layer, they remain at a high level in the atmosphere due to their long atmospheric lifetime (see Figure 1 and 2). CFC-12 has a Global Warming Potential (GWP) of 11,000 and atmospheric lifetime 100 years) . This potent CFC is still having by far the highest global warming impact of any of the halocarbon refrigerant gases and still has an atmospheric concentration of over 500 parts per trillion (ppt) in 2010 . 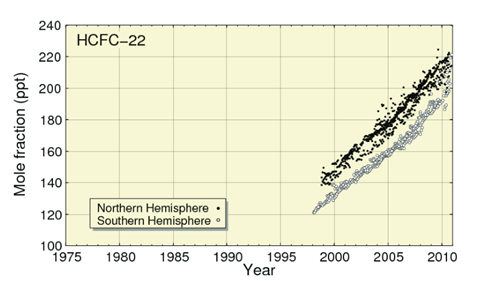 As shown in Figure 1, atmospheric concentration of CFC-12 was higher in 2010 than in 1989, the year the Montreal Protocol was first enforced. 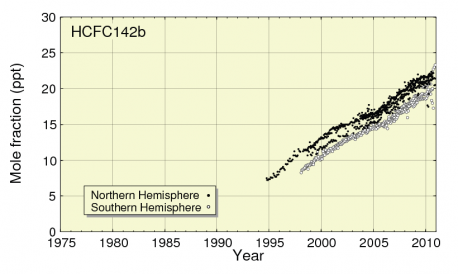 CFC-113 was also at a relatively high level in 2010, at over 75 ppt, as shown in Figure 2. Recent research has shown atmospheric levels of 3 other types of CFC to be increasing, with CFC-113a being the highest of these. levels of CFC-113a (otherwise known as R113a) had reached 0.48 ppt in 2012  more than doubling in the two years since 2010 and it is still rising at an accelerating rate  . Several recent news reports have discussed this, saying the source of CFC-113a is a mystery [5, 6]. However, loopholes in the Montreal Protocol allow it to be used as an intermediate chemical in the manufacture of other commonly used chemicals, including (HFC-134a) the most popular CFC refrigerant gas  . It is also used as a precursor in the manufacture of flouro-pesticides . There were several online adverts for CFC-113a supplies, such as on the website, Alibaba.com [9,10]. However, some of these seem to have been taken down since I found them on March 10 2014. However, the chemical is still for sale, listed as R113a. The large minimum volume for orders from a major manufacturer of 1140 units of 200L canisters in one advert (which was still up on March 11, 2014)  would inevitably increase the chances of excess unused product escaping to the atmosphere if not properly disposed of. This minimum order size is 228,000 litres of CFC-113a. 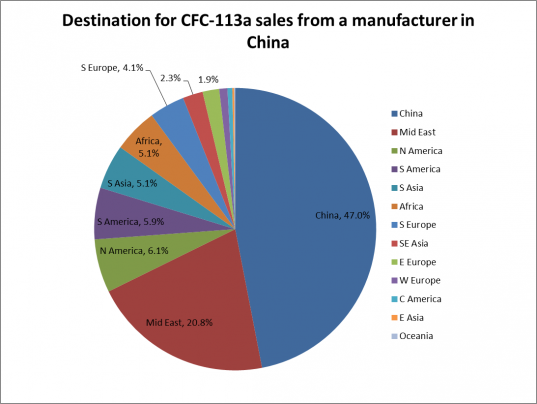 Another supplier of CFC-113a based in China  has 46% of its consignments going to markets in China, with the Middle East being the second biggest market (see Figure 3). 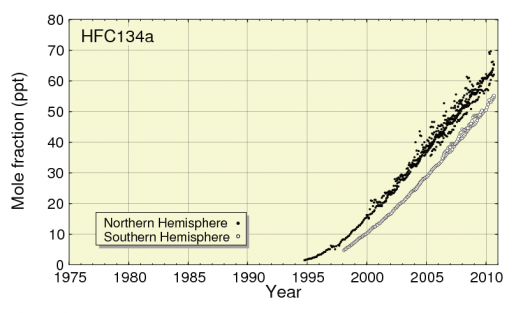 The atmospheric level of CFC-113a is approximately 1000 times lower than CFC-12 levels, and 140 times lower than CFC-113, so is still relatively insignificant in it’s impact compared to these other ozone depleting greenhouse gases.However, the rise of use and atmospheric levels of R-134a, of which CFC-113a can be used for production, will lead to a further rise in CFC-113a levels. The use of CFC-113a in the manufacture of pesticides  is also of concern, as global warming is likely to increase the threat to agricultural crops from pathogens and pests, hence increasing the use of synthetic pesticides to attempt to deal with this increasing problem. Pesticide manufacture will therefore be another growing source of CFC pollution unless loopholes are closed in international and national legislation. Despite policy efforts to gradually phase them out due to their impacts on the ozone layer, continued production of HCFCs has led to their atmospheric level doubling in the last decade and their production is still expected to continue increasing to 2030, particularly in developing countries such as China where there is rapidly increasing demand for refrigeration . HCFC-22, the most popular HCFC refrigerant, has a 20 year GWP of 5160 and its production leads to the emission of HFC-23 which is an even more potent greenhouse gas, with a 20 year global warming potential of 12,000. 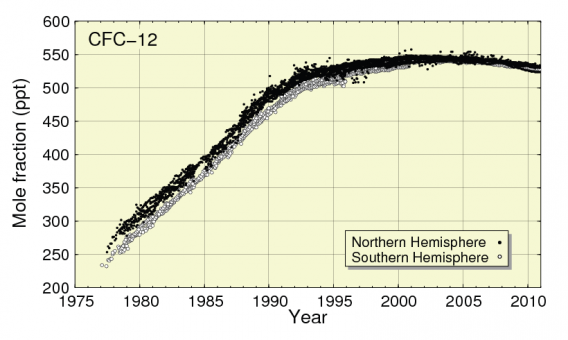 As shown in Figure 5, HCFC-22 had reached a level of over 220 ppt in 2010 (an atmospheric concentration over 450 times greater than CFC-113a) and continues to rise rapidly. The newly discovered HCFC-133a, featured in the recent paper  and associated news stories, reached 0.37ppt, an atmospheric concentration approximately 600 times lower than levels of HCFC-22 and 60 times lower than levels of HCFC-142b. There were around 530,000 supermarkets worldwide in 2006, using approximately 550,000 tonnes of refrigerant .The average refrigerant leak rate is 10% per year . 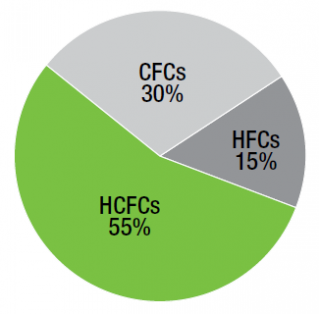 The estimated total amount of emissions from HFCs (not including HCFCs) used in commercial refrigeration in 2010 was 346Mt CO2e . This is likely to have increased substantially since, and is likely to continue to do so, particularly in non OECD countries with increasing demand for refrigeration . The most common supermarket HFC refrigerant, R404a, has a 20 year Global warming Potential (GWP) of 6010, meaning it is over 6000 times more effective at trapping heat in the atmosphere than CO2 over a twenty year period. Therefore, the emission of just 1 kilogram of this refrigerant causes the equivalent global warming effect of driving a 2 litre Skoda Octavia for 25,000 miles . Rapid rise in HFC-134a use. Use of HFC-134a, a popular refrigerant and a constituent of R404a, has also been rapidly increasing as CFCs are replaced. Atmospheric levels of this gas have increased by over 400% in the last decade .This refrigerant gas has a 20 year GWP of 3710. Global production of HFCs is set to increase five-fold by 2030, mainly due to increasing demand for refrigeration in developing countries .The rise in its production could also account for the rise in CFC-113a, which can be used as a precursor chemical in its manufacture. 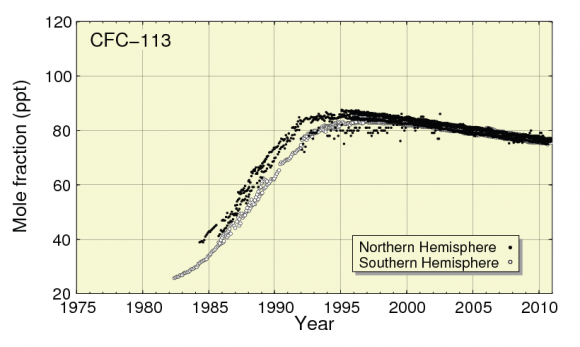 The rapid rise in atmospheric levels of HFC-134a is shown in Figure 7. Any potential climate benefits from the phasing out of CFCs are being cancelled out by increasing demand for replacement gases which are also adding to global warming, both directly, through the rise in HCFCs and HFCs as replacements, and indirectly by the use of CFCs, in the manufacture of other refrigerants as well as pesticides. Blog by Daniel Kieve. This entry was posted in CFCs, Climate impacts from food systems, HCFCs and HFCs, Refrigerants on March 11, 2014 by admin. Food security threat as global grain yields plateau. Lester Brown, a former US government plant scientist and founder of the Earth Institute, Washington, says many countries, including France, Germany and the UK may not be able to increase food production because many staple crops are close to their physiological growing limits. In an interview by Guardian journalist John Vidal, published on 8 July 2013, Brown points out the threat to global food security this may pose. “In France, Germany, and the United Kingdom, the three leading wheat producers in western Europe, there has been little rise in yields for over 10 years. Other countries will soon be hitting their limits for grain yields. Agriculturally advanced countries are hitting natural limits that were not widely anticipated,” Brown points out. “Rice yields in Japan have not increased for 17 years. In both Japan and South Korea, yields have plateaued at just under five tons per hectare. China’s rice yields are now closely approaching those of Japan and may also soon plateau,” he said. After decades of constantly rising grain yields, governments have not understood the significance of the plateauing of yields and the fact that it will become much harder to feed the extra three billion people expected to be alive by 2050, said Brown. Britain, he said, will start collaborating with other European countries including Sweden to investigate why yields are not improving. “Crops do have physiological limits but we think we are a long way from that. There is no one reason but we think the genetic pool needs to be refreshed for [crops such as] wheat, but there is no single factor,” said Knight. Yields depend on the amount of sunlight that plants get, the water and fertiliser they receive, and the seeds. But, says Brown, traditional plant breeders have pushed genetic potential close to the physiological limits, leaving farmers with limited options to grow more. 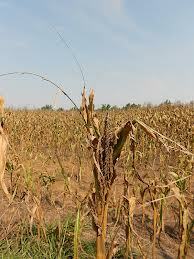 “Grain yield per hectare, like any biological growth process, cannot continue rising indefinitely. It has its limits. Once we remove nutrient constraints by applying fertiliser and we remove soil moisture constraints by irrigating, then it is the potential of photosynthesis and local climate that limits crop yields,” he said. The best long-term hope of increasing yields, say many governments, is dramatic advances in genetic modification. The UK government, The Bill & Melinda Gates Foundation, and the International Rice Research Institute (Irri) based in the Philippines have put more than $20m into trying to engineer more efficient photosynthesis in rice to increase production. However, progress has been slow and there is no likelihood of a breakthrough for many years. Another GM target is to produce a type of maize with nitrogen fixing abilities found on the roots of legumes. This also many years away. Unfortunately, in the real world, GM technology has not so far been able to increase yields significantly, instead it has only managed to increase greatly the use of glyphosate herbicide on large monocultures, having many detrimental effects on biodiversity, human health and soil quality, particularly in South America where GM soy plantations for livestock feed has been the predominant driver for deforestation and other land use change in Argentina and elsewhere. Every year, approximately 720 million tonnes of such GM soy is imported to EU countries including the UK, for use as livestock feed. UK becoming a net importer of wheat! Implications for food security and biofuel policy. Should 1st generation bioethanol production be suspended to help avert food grain shortage and price spikes in the face of low yields / harvest? Following last summer’s diminished harvests around the world, things have got from bad to worse for world grain production. Yet with the US biofuel mandate and RED/ FQD targets in the EU, more and more grain is being earmarked for fuel production. In the US, over 126 million tonnes of corn due to be turned to bioethanol this year. In the UK. One bioethanol plants set to use 1.1m tonnes of feed wheat. That is equivalent amount to the annual average direct wheat consumption of over 15 million people (using FAO/ UN figures). However, now the UK cannot produce enough wheat to meet domestic food and feed requirements, or spare any for export, let alone bioethanol use. See this BBC news item for further details. Global food security should be the utmost priority now and unless measures are taken to compensate for lower harvests, price spikes and shortages will again exacerbate poverty and social unrest. As wheat production has dropped, there has been an increase in the significance of the competition for agricultural land and feedstock between the food and biofuel industries. First generation bioethanol depends on food crops as feedstock. The reduction in UK grain production has led to trouble for both industries. As a result, the largest bioethanol refinery in Europe, the Ensus plant, has just closed down for the third time due to a lack of usable, economically viable wheat as feedstock. The plant tried to compensate for adequate wheat supply by importing EU maize. However, it has now been shut down until the situation improves. However, with uncertain yields and production due to adverse weather events, the priority should now be to build up the diminished grain stocks as soon as possible in case of further severely reduced harvests worldwide. SOS – Save Our Soils! We get 99 percent of our food from the soil. Yet through neglect, lack of knowledge or abuse, much of the worlds soil is degraded, eroded or turned to desert. 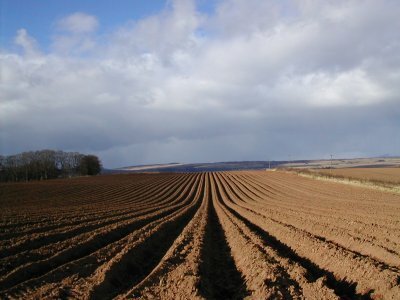 In the EU alone, the EC Soil Impact Assessment of 2006 estimated the annual cost of soil degradation to be as much as €38 billion per annum.